"Cast Iron has not suffered the corruption in material and technique that has changed early to present-day wrought iron." It may help the layman to distinguish "wrought" from "cast" iron by examining the work in question - looking for squared, rounded or rectangular "bars" - the raw material of wrought iron work. More detailed, decorative or multidimensional shapes are generally "cast". Originally, wrought iron was a specific carbon content composition with specific relative elasticity. When heated, it could be skillfully hammered and stretched, artistically twisted and bent into the desired shapes by individual craftsman. Today's mass produced wrought iron has limited application - especially in fine restorative and reproduction work. As it is commonly manufactured from stock half-inch bars as well as light weight steel channel, the dimensional characteristics of many specific "period" architecural styles can not be achieved. And, with so much "bad iron" in the mass production marketplace today, a question of durability arrises in the use of mass-produced wrought iron components. Cast iron is, and has always been, a particular composition of iron that is heated to a liquid state and is poured into precision molds carefully prepared for accurate reproduction. Since these molds can take virtually any shape, restricted only by the talent of the patternmaker, the range of cast iron products and castings is practically unlimited. Cast iron gained great popularity in the United States in the nineteenth century, because of it's suitability to the lower-cost mass production process...in a time when wrought iron was still an individual hand craft. With the introduction of mass produced wrought iron, the proliferation of cast iron foundries declined. Today, casting of iron for architectural work has returned to being more of a custom craft, available from the specialists at Architectural Iron. 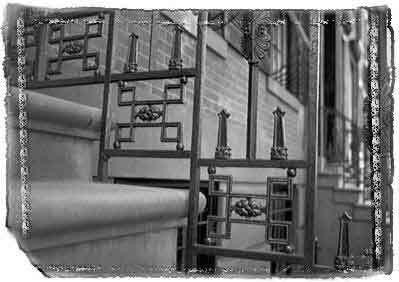 Architectural Iron Company manufactures ornamental cast iron, as shown in the catalogue of stock iteems... and also produces specialized pieces for restorative work, where frequently only a single casting of a pattern will be made. The balance of the ironwork is wrought. Note, in this close up of an Architectural iron 19th century reproduction, the detail and classic beauty of the cast pieces. They were created with the original methods and materials of the period.